Samsung and Xiaomi are the only top five smartphone brands in the world yet to launch a smartphone with a notch. However, it’ strongly speculated that with the Xiaomi Mi 7, the Chinese company would be joining the notch train, leaving Samsung alone. But this news will surprise many as the so-called design leader Samsung has now patented a notch display smartphone in China, meaning Samsung could launch a smartphone with Apple iPhone X-like notch in the near future. As per a new patent document issued to the China Bureau of Intellectual Property, Samsung’s upcoming notch display smartphone will offer a super-high screen-to-body ratio. 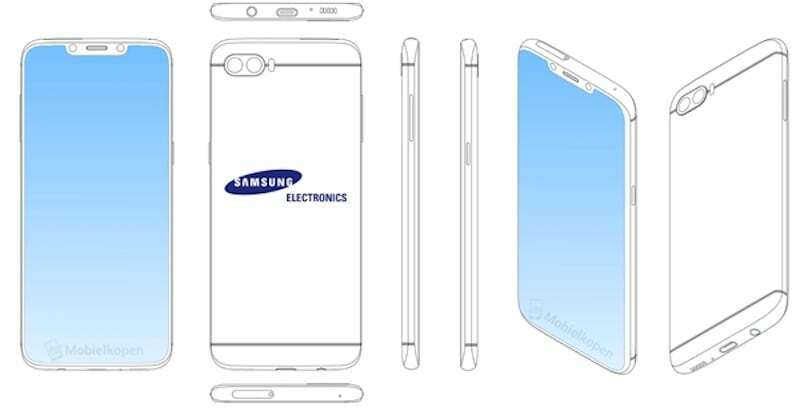 The sketchings of the Samsung smartphone are revealed too. As you can see in the image, the Samsung patent shows a smartphone with a notch housing the earpiece and camera modules, but what’ surprising is the absence of chin. Until now, the Apple iPhone X is the only device without a chin, and Android manufacturers whoever copied the notch design also included a decent chin. As usual, the notch on the Samsung patent is smaller than the Apple iPhone X’s notch. That said, there are not many details available about the Samsung notch smartphone and it’s unknown on which device Samsung is planning to include the notch. The device in question would be the Samsung Galaxy Note 9, but that’s highly unlikely because Samsung is said to launch the Note 9 in June itself. This essentially means that Samsung must have already finalised the design of the Note 9. The Galaxy Note 9 already paid a visit to a benchmarking site, so rule out the notch design for the Note 9. Maybe Samsung could use the notch design on a mid-range smartphone and if it gets a good response, it might implement the same in an upcoming flagship device, possibly the Galaxy SX or S10 or whatever it’s expected to be called. All these years when Apple copied Samsung, sheeple were like Apple innovates it to the highest degree and doesn’t copy, but now they pounce of Sammy. Such weirdos. What Apple copied from Samsung ? Android as a OS itself is a clone of iOS.